Grezzo is a studio that’s got a decent pedigree; it’s responsible for the two Zelda remasters on the 3DS and the little known Ever Oasis from this past summer. By all counts, the studio puts out solid work, and it stands to reason that Nintendo would continue utilizing them for smaller projects like they’ve done in the past. Though we don’t know what the studio is working on right now, a new job listing has given some potential insight into what’s coming next. On its website, Grezzo has posted listings for programmer positions, asking if they’d like to help make a “legend”. The listing specifies HD experienced developers are preferred, while Unity and Unreal Engine developers are also wanted. Considering that there’s a “2” on the end of the legend, it seems this could be referring to an Ever Oasis 2, but bear in mind that when a similar posting was made in 2014, The Legend of Zelda: Majora’s Mask 3D was announced a few months later. What do you think? What would you like to see Grezzo work on next? Do you think more Zelda remasters are on the way? Share your thoughts in the comments below. Ever Oasis 2 please for Switch! The first was a lovely game, i'd love to see a sequel. Their hints make me believe it's a Zelda 2 remake. That would be really awesome IMO. I've never played Ever Oasis. I'd be psyched to see another Zelda remake of some sort on Switch though! They did a fantastic job with the two N64 games. Eh...it's probably not a Zelda game. Majora's Mask 3D went into development shortly after Ocarina of Time 3D. By the time the job listing went up the first time around, Majora's Mask 3D was more or less done. Ever Oasis 2 seems more likely, or a game in a similar vein. Zelda 2 remake for the 3DS or Skyward Sword HD for Switch! Zelda 2 HD remake on Switch please! Zelda II remake, or Skyward Sword remake. Not to many Zelda's left to remake. If they did remake links adventure I feel like it would have to at the very least be ported into the OOT 3d engine to make it worthwhile. Right? Now that I think about it a link to the past reborn sounds mighty tasty. Just imagine the possibility. I hope a new version of Twilight Princess released for Switch. I want that game on Switch so much! I'd sure love it to be Ever Oasis HD or 2. That game is a gem. 1000 Year Door remake please! I'll take a Zelda remake, for sure. Half life 2 for 3DS! But really a Skyward Sword remake on Switch with improved controls and design tweaks would be greatly welcomed. I remember an interview where they mentioned how they would have loved to have a multiplayer mode in Ever Oasis. The tone of the interview made it sound like they have plans for a future title. However, I highly expect a Skyward Sword HD to happen soon. They already have the perfect controllers for it. A Zelda 1 and 2 remake/reimagining like Metroid 2 just had would be sweet but Ever Oasis sounds more logical. Must be a Zelda title. The thing is, why would they remake Zelda 2, the black sheep of the series before remaking the original? @Melkac Jeez, calm down. I happen to think that Ever Oasis has a pretty fantastic art style, and I'm sure the tens of other fans would agree. Ever Oasis 2 seems incredibly unlikely... but here's hoping. I will say something random: Zelda 2 remake! Anyway, a shame I have yet to properly play Ever Oasis. I have it in my possesion though, so its a matter of finding the time and mood to play it. I'm really hoping it's a Skyward Sword HD port for the Switch, or maybe even Zelda: The Wand of Gamelon HD. Given the popularity of the remake of Metroid 2, maybe Nintendo sees an opportunity here to do the same for Zelda 2. Would love to see that personally. If there's one game in the Zelda franchise that needs a remake, it's Zelda 2. Because the original, ultimately being the basis from which every other 2D Zelda drew from, has little else to offer in a remade form. Adventure of Link on the other hand is unique within the franchise and has plenty of room for improvements in all regards that'd elevate it to something unlike everything else in it. Personally I'd love if this were an AoL remake since I love the game, but the fact they're looking for HD experienced developers seems to clash with that idea. Why are people saying a Skyward Sword remake? Am I missing a connection here? Oracle of Ages and Oracle of Seasons HD? They're 2 great Legend of Zelda games that would make awesome remakes on Switch in my opinion. It's great that Nintendo published an original IP from Grezzo after all the years of working together. 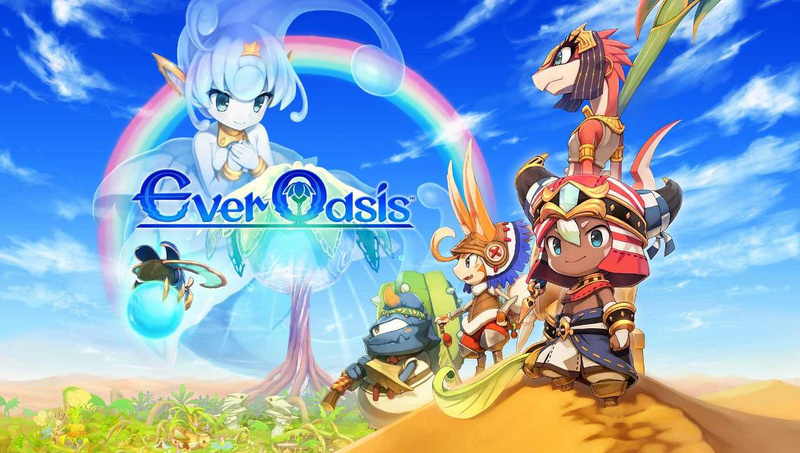 I still really want to play Ever Oasis, and I hope this new project is own of their own as well. Grezzo assisted in puzzle and environment design for Skyward sword, and has already been remaking two Zelda games. A fancy version of Skyward Sword for Switch wouldn't be entirely out of the question. Right after a successful remake of Metroid II? They'd be right sly dogs to pull that one. Zelda II remake for 3DS continuing the trend of Nintendo not killing off the 3DS just because the Switch exists. Ever Oasis 2, please ! With Easy to play for beginner, Full 3D Dynamic Camera Angle, Open World like Breath of the Wild. Ever Oasis 1 still a bit hard for beginner. Just imagine your feeling, you can die easily at the beginning of story if you got strike by Cobras. It's definetly Skyward Sword HD for Switch. Finally! I've been waiting for this for a while, since I missed it on Wii. I hope they will oficially announce it on Nintendo Direct in January. i would love another Ever Oasis....loved that game. Still have to finish the game. I'm at the end I think and am having a hard time with it lol that's why I would love a sequel......they need to give the Zelda remakes a rest anyways. Legend Of Zelda 2 remake. Calling it. I loved Ever Oasis! Played it all Summer. I wouldn't mind a HD remake on the Switch. This game deserves more attention. I am calm. I'm not sure what led you to think I'm not??? But yeah I'm sure all three of Ever Oasis' fans agree the art style was perfectly fine. Ever Oasis 2 on Switch? Wow! Nooo. I can't go back after Breath of the Wild. Better give us Ever Oasis 2. Do people forget that Grezzo also made Tri Force Heroes? That game deserves a sequel on Switch. @KryptoKrunch That's exactly what I thought. And while I get that the game is a decent game and has a following, its one of the entries that I have never played more than once. It's just never clicked with me. So I would love to see what a remake does that maybe improves or adds on to make it a better game. Skyward Sword is the last 3D Zelda that hasn't been given the HD treatment and it is a very underrated game and great origin story. Nintendo's got my 60 bucks locked down for that. As much as I love Zelda II, I heavily doubt Nintendo would spend the money to remake it. I loved it, but I grew up with it, but this generation's kids wouldn't beg their parents to put up the money for a side scrolling Nintendo-hard Zelda platformer. Skyward Sword HD for Switch. I trust Grezzo by this point. I'm sure that whatever the game is, Zelda or otherwise, it'll be worth playing. A Zelda II remake in the vein of Samus Returns could be amazing. I'm in! I would love a sequel or port of Ever Oasis. I had fun with the little time I spent with it but I'm just spending most of my time on the Switch nowadays. @SLIGEACH_EIRE I'm guessing it's because the first game already lives on in games like A Link to the Past and Breath of the Wild when it comes to the game design and mechanics. Zelda 2 could be getting a chance simply because of how different it is compared to the other Zelda games. Well, at the end of the day, all of this is speculation anyways. EDIT: Personally, I think it's a sequel to one of Grezzo's own games. Specifically, another game that has "Legend" in the title, The Legend of Legacy. The "Legend2" would be fairly accurate here as well. Ever Oasis too or a Legend of Zelda 2 remaster perhaps. I'm all for remakes handled by these guys! @leo13 Zelda 2 is almost all platforming, the BotW engine will be a waste to use it on that game. @cowntsikin I don't see why. It's an NES game being remade with todays graphics. Which means a lot more of environment to the world in overworld, towns, battle areas, and dungeons. homes too. Possible new moves added. Miyamoto wanted to add giant enemies to Zelda II but because of limitations from NES mechanics it would be harder to do. With this he can fix and add everything he wanted in Zelda II. @Alikan That isn't going to stop kids from playing Zelda man. Come on we got three black sheep games that have been remade although one is on SNES. American version of Super Mario Bros 2 remade on NES. Black sheep games Metroid 2 and Fire Emblem Gaiden/FE2 were remade and released this year with Gaiden being said to be worse than Zelda II. Even so most of the 80's kids are still alive and would love Zelda II to get remade. My dad was born in 1966 and played Zelda II when it released which was two years after he graduated from Highschool and he loved it. He got me into the series when I was six and now I'm 16 and have currently beaten all the games with Zelda II being one of my favs and I'm hoping they remake the game it deserves one more than many of the other games in the series that have gotten one. Kids will ike the game even if it's different. We'll most likely give lore cutscenes on what happened to Princess Zelda I that was talked about in Hyrule Historia. We'll see the curse put on her and probably other things too. @TheDownfallHero7 I say it's wishful thinking, but I wouldn't complain if they remade Zelda II. Or Legend of Legacy 2. The first game came out back in January 2015, before Majora's Mask 3D. @theinstruct0r It's possible although when he made Majora's Mask 3D he asked "Would you like to make a legend with us?" which was linked to MM3D. This time he said the same thing but with a number 2. Now that doesn't automatically link it to Zelda but it's a possibility.